Nassau Legislator Rose Marie Walker was pleased to join Nassau County Executive Ed Mangano and other elected officials to announce the County’s successful challenge to the state’s onerous MTA Payroll Tax which taxed all business owners $.34 per $100 of payroll whether they used MTA services or not. Since the Payroll Tax was imposed in 2009, Nassau has paid $9.9 million towards this tax. 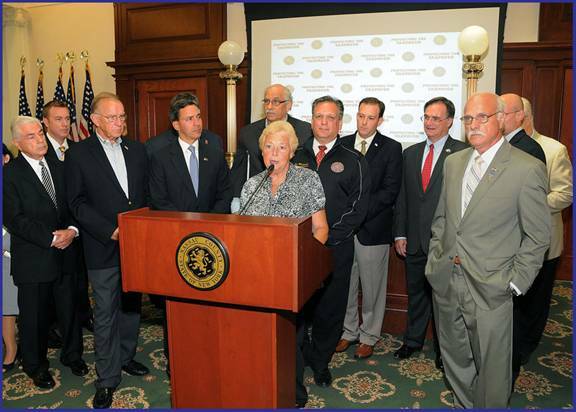 Pictured with Legislator Walker are: County Executive Mangano, fellow County Legislators from Nassau and Suffolk, State Senators Jack Martins, Lee Zeldin, and Carl Marcellino, as well as local Mayors, State Assemblymen and local business owner William Schoolman.